Ministry of Overseas Pakistanis and Human Resource Development, Govt. of Pakistan has announced 04 latest Government Jobs in Daily The News Newspaper. Jobs titles and number of posts is as follows, Assistant (BPS-15) 01 Post, Steno-typist (BPS-11) 03 Posts. Interested Candidates can send their application through Central Testing Service (CTS). Candidates should be citizen of Province Punjab and Province Sindh. 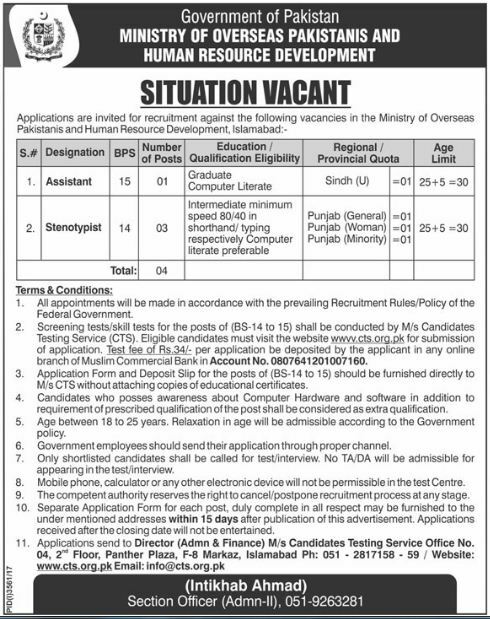 Ministry of Overseas Pakistanis and Human Resource Development 04 Jobs, 08 January 2018.